It's official - the Fall 2016 Rising Stargirls "The Universe and Me" workshop has wrapped up at YWCA Pasadena-Foothill Valley! 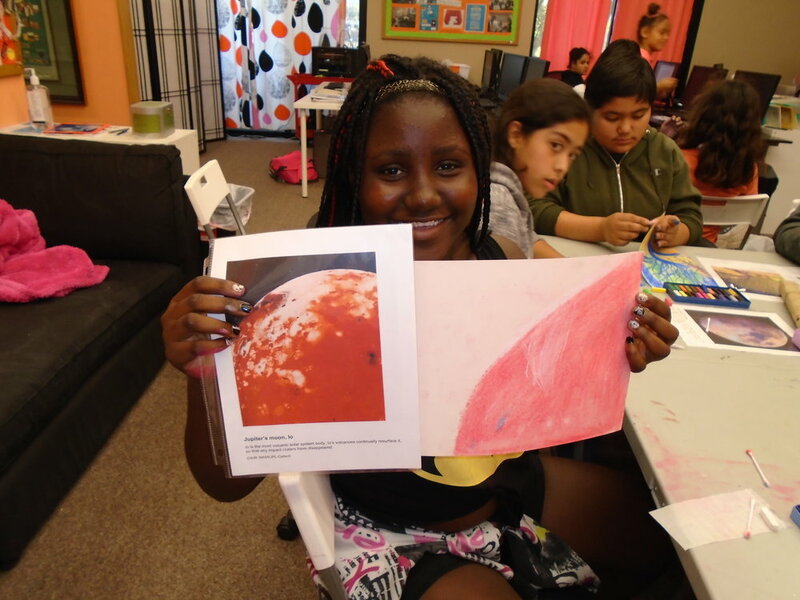 From September 27 - October 20, the girls explored the universe through creative lenses; a few favorites included designing their own exoplanet, created their own constellations and origin myths, and developing poems and science communication pieces about life elsewhere in the universe. Many of the girls were so excited to learn about astronomy & astrobiology, bringing their enthusiasm and creative ideas each day. Our last day culminated with an award ceremony to celebrate those who had successfully completed the program, raffling off items such as Celestial Buddies and a photograph donated by award-winning photojournalist Eugene Louie. 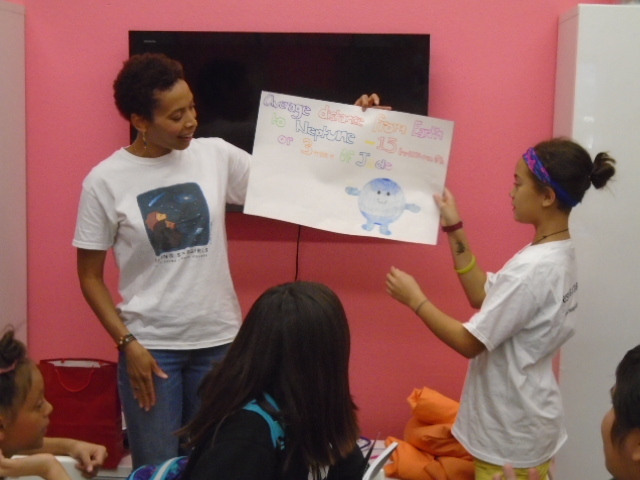 Our girls also got to take home t-shirts designed by Rising Stargirls, astronomy-themed jewelry donated by Astronobeads designer Bea Doheny, and astrobiology graphic novels and other astrobiology/astronomy-themed gifts designed and donated by the NASA Astrobiology Institute. Founder and Director Dr. Aomawa Shields' TED-Ed Lesson is Live! As the number of “potentially habitable” planets that astronomers find continues to rise, we seem ever closer to answering the question, “Are we alone in the universe?” But should we be looking for life elsewhere? Rising Stargirls Founder and Director Dr. Aomawa Shields navigates the murky waters of pursuing curiosity in her latest TED-Ed lesson, "Should we be looking for life elsewhere in the universe?" The events of recent weeks in the United States have affected many in the US and across the globe, and those within some of the communities we serve more directly. Whether you are a young girl, a parent, an educator or both, it can be difficult to carry out the daily or weekly activities of living and working during these difficult times. On behalf of Rising Stargirls, thank you for everything that you are doing to inspire young girls from all backgrounds — particularly those from backgrounds traditionally underrepresented in the sciences — to explore the universe. These may seem like small actions amidst the turmoil, but they are not. Your actions are helping to build a more inclusive community of dreamers and scientists, and one that is reflective of the diverse global community of which we are all a part. Thank you. Please continue to take care of yourselves and the girls that you serve. The Rising Stargirls Teaching Handbook is now available! The Rising Stargirls Teaching and Activity Handbook is here! All of the activities used in Rising Stargirls workshops, plus educator resources and a suggested structure for workshops are provided in this manual. Download it for free and use it in your classrooms and informal learning environments anywhere in the world! Rising Stargirls founder Dr. Aomawa Shields presented a talk "Reaching Middle School Girls From Groups Underrepresented in the Sciences With an Innovative Approach to Astronomy and Astrobiology Teaching" at the Astrobiology Science Conference in Chicago, IL, held June 15-19, 2015. Part of the session "Astrobiology Research and Education at Minority Serving Institutions", Dr. Shields presented an overview of and lessons learned from the pilot workshop carried out with 10-15 girls at Irving STEAM Magnet Middle School in Eagle Rock, CA Feb 25-Mar 9, 2015. Among other findings, Shields presented results from evaluation and assessment strategies implemented before and after the workshop, in consultation with the Science Education Department at the Harvard-Smithsonian Center for Astrophysics. Responses to anonymous evaluation forms revealed that by and large the girls specifically enjoyed the creative aspect to the astronomy/astrobiology workshop, and would want to do more of these kinds of activities in the future. Whereas none of the girls had heard of the term "Astrobiology" prior to the workshop, nor did they know what it meant, at the end of the workshop, when the girls were asked to record what came to mind when they heard the term, they mentioned Mars and the search for life, and the study of life on other planets. The girls were also asked to rate their level of agreement from 1 (strongly disagree) to 6 (strongly agree) on a serious of four statements, before and at the end of the workshop. The most striking difference in response was for the statement "I see myself as a science person." Before the workshop, only 20% of the girls answered with a 4 or greater. After the workshop, more than 60% selected a 4 or greater. These are encouraging results, and we look forward to comparing them to similar evaluations of future workshops. What a great first week it has been for Rising Stargirls! We kicked off the workshop "Universe: More Than Meets the Eye" at Irving STEAM Magnet Middle School in Eagle Rock, CA. Many thanks to the enthusiasm and initiative of Irving's Esther Lee - who saw a need for a Girls STEM club and created one, reaching out to me to help kick it off with a 3-week astronomy workshop. We meet Mondays and Wednesdays for two hours after school, Feb. 18-Mar 9. On the first day of the workshop the girls received their own "playbooks" - individual journals that they use to record their responses to questions I ask (such as "do you talk to your friends and families about science?" "Do you believe that you can do well in science"), do free writing in ("Write for 5 minutes. The topic is 'I am thinking of'. "), and draw in ("Draw what you think a typical scientist looks like"). We played theater games to get them on their feet and moving, and also a name game where the girls said their names, a favorite hobby, and a place on Earth or in Space that they would go to if money were no object (all the girls chose places on the Earth. Interesting.). We wrapped up the day talking about constellations, reading constellation myths from different cultures, and having the girls arrange themselves into constellation shapes in small groups. At the beginning of the next meeting I shared with the girls my own personal story of how I got interested in astronomy and astrobiology. I talked to them about my family background, and where I came from. I thought it was important that they know that I didn't come from a family of scientists, and in fact, no one ever told me that I should be a scientist. 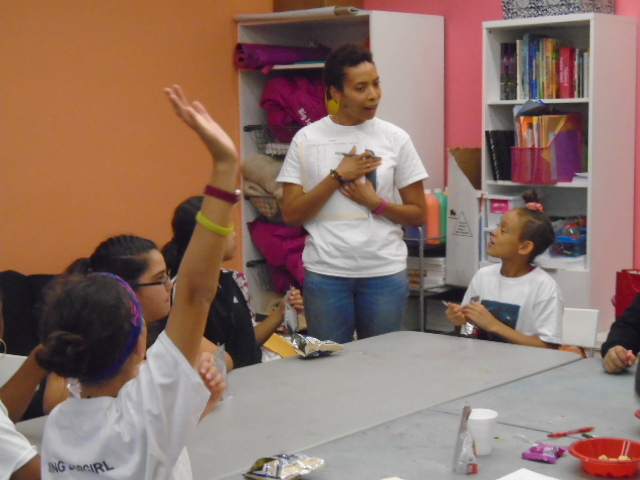 I talked to them a lot about how when I was younger I was afraid to raise my hand for fear of sounding or looking stupid, and how it wasn't until I started raising my hand and keeping it there until I was called on, and developing strong support structures - mentors, communities of people I could be myself with - that I really started to succeed. I also got to tell them about my grandmother, who was a math major at Tennessee State University in the 1930's, and how she struggled to feel like she belonged in that field. So powerful! Then the girls spent the rest of the workshop session creating their own constellations and origin myths. I'm having such fun reading through these. This is an activity from Kelsey Johnson's organization Dark Skies, Bright Kids, and I'm so happy she shared it with me. The girls are so creative! Then they decorated their playbooks with pictures from old astronomy magazines - images of planets, stars, galaxies, nebulae. The books look fantastic. Yesterday we spent the day talking about scale. I shrunk the Sun down by 10 billion times (because I am that powerful) until it was the size of a grapefruit, and had one of the girls count 15 large paces away as she walked, to where the Earth would be. Then I asked them how far they thought she would have to walk to get to the nearest star. Many said "the end of the school yard!" or "the end of the block" when I prompted them to go farther. When I told them "New York City", it blew their minds. Tons of "Wow! "s and "Whoah!"s. It was awesome. We also talked about what a star is and how all the elements we have on Earth come from stars, and we do too. Finally, I had the girls calculate (with my help) the diameter of a solar system planet, or the distance from Earth to the planet, in units of themselves! So the distance from the Earth to Saturn isn't just 890 million miles, it is "one trillion Amahiranys", for example. Then the girls got to decorate posters with these statements about the planets. One of my favorite things of the day said by one of the girls when I tried to hand her Pluto to do her calculation: "I don't want to do Pluto! It isn't even a planet!". Priceless. Just teaching these girls astronomy, even with the traditional hands-on activities, wasn’t going to be enough. If I wanted these girls to feel welcome and confident in this field, to the point where they would even consider pursuing astronomy formally in high-school or college, then I was going to have to get creative. So I decided to develop a workshop for underrepresented girls in grades 6-8 that will teach key concepts in astronomy, highlighting what is beyond what we can see with our eyes, using nontraditional methods. The workshop is entitled “The Universe: More Than Meets the Eye”, and integrates creative strategies such as free writing and theater exercises into the informal hands-on framework. The result is a new, innovative astronomy curriculum that addresses each girl as a whole by providing an avenue for individual self-expression and personal exploration that is interwoven with scientific engagement and discovery. In the workshop we cover: Misperceptions of the night sky and the planets in our Solar System; the unseen mysteries of the Milky Way Galaxy; and what scientists are learning about exoplanets without seeing them directly. It will be taught 1-2x per week for two hours each day for approximately 3-5 weeks, and culminate in a group performance of the astronomy theater and writing pieces created by the girls. 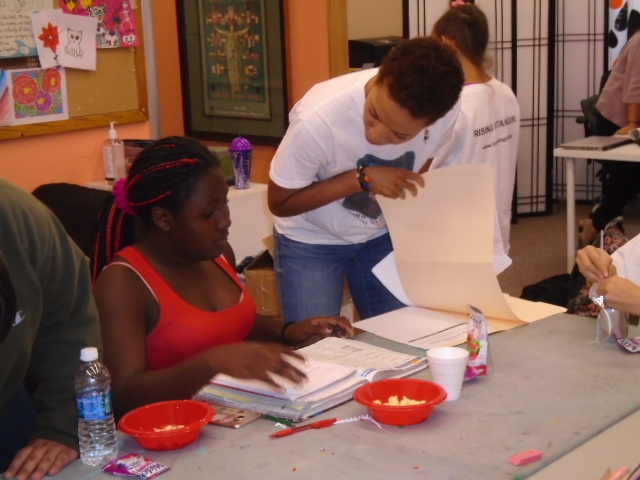 One of the activities involves passing around plushies of Solar System planets, along with actual mission images, and having the girls write down in their “playbooks” (individual workbooks the girls will get on the first day of the workshop) the first words that comes into their minds when they see the planets. “These words don’t have to make sense”, I will tell them. “In fact, it might be even cooler if they don’t. Don’t think. Just write.” When we look at images of the planet Earth, I’ll ask them “What’s different about the Earth compared to the picture we saw of Jupiter? What do you notice? You can’t get this wrong. This is about what you see for yourself.” Then we will discuss differences between our initial visual perceptions of the planets, and the actual characteristics of the planets themselves. We’ll play “Name That Planet”, where at first the girls have to get their teammates to guess the name of a planet that I give them by drawing on an easel, à la “Win Lose or Draw”. Then Part 2: They can’t draw, but must only use adjectives to describe the planet verbally. Part 3: They can only use their bodies to form clues about the planet, but no sound or props of any kind. I will teach the workshop in Los Angeles this winter and spring, and in Cambridge during the summer as part of the Science Club for Girls program “Young Leaders in STEM”. With input from the CfA Science Education Department, I will implement various assessment strategies, and create a teaching guide that will be available online. This bi-coastal outreach approach will move me one step closer to my long-term goal of creating my own organization, Rising Stargirls, which involves girls of all colors in astronomy learning, exploration, and discovery. Maybe from one of these stories comes a poem about the first memory of a star in the mind’s eye of a young African-American girl. And that connection I want to help her discover between her right foot and the outer layers of an exploding star might lead her to feel ownership of that star up in the sky, because she wrote a poem about it once and it was hers. How we feel and what we think is important. Feelings and thoughts can make us leave a place we don’t feel comfortable in, or not cross its threshold at all. They can also help us find our way back to a place, as it did for me when I came back to astronomy. I fell in love with it again. That’s the only way I can describe it. It was love—for the moon I looked up and saw at night, for the stars in the sky and what might be orbiting around them. And I am hoping that by encouraging these girls to bring who they are as people to what they study, perhaps a relationship with the universe might blossom for them too. To bring this workshop to a classroom or informal setting near you, email Dr. Aomawa Shields at ashields<AT>astro.ucla.edu. This post appeared on the Women in Astronomy Blog on February 4, 2015. It can be found here. Gurian, A. (2012, August 30). Girls with Low Self-Esteem: How to Raise Girls with Healthy Self-Esteem. NYU Child Study Center. Retrieved from URL (www.education.com). Rakow, S. (2009, November 12). Middle Matters: Guiding Gifted Girls Through the Middle School Maze. National Association for Gifted Children. Retrieved from URL (www.education.com).